Gears: 27 Speed. Shimano FD-M530, 31.8mm clamp, top swing, dual pull [F]. Shimano Deore [R]. 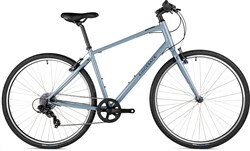 Wheels: Specialized/Alex Crosstrail, 700c, double wall w/ machine sidewalls, 32h Rims. Specialized, forged alloy, double sealed, polished races, 32h, steel QR [F]. Specialized, forged alloy, double sealed, ground race, cassette, QR, 32h [R]. 1.8mm (15g) stainless Spokes. Brakes: Specialized linear pull Levers. Alloy linear pull w/ adj. housing, 1pc. Pad [F]. Alloy linear pull w/ adj. housing, 1pc. Pad [R]. 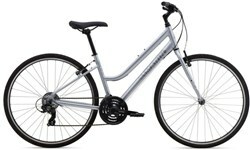 Extra Features: Specialized alloy two bolt, 27.2mm Seatpost. Specialized Borough XC Sport 700x45c, 60TPI, wire bead Tyres. What is a Hybrid Sports Bike? These are hybrids for the fit! Theyre more for the quick run into work or for a fast hour ride on the weekend rather than purely casual leisure riding. Despite having lots of gears, the lighter components often make this bike a closer relative to the road bike than the mountain bike. A wide range of customising accessories are available to fit these models.